Explore the Deadly and Dangerous World of Utopia! Something strange is happening on the planet of Utopia. Numerous expeditions have set a course for it in recent times, but none of them have returned. As the captain of a small but hardy band of space explorers, you have made it your mission to figure out why. Evolution: Battle for Utopia will put you directly onto the surface of a harsh alien world located on the edge of the galaxy. It is full of life, some of which is human, but to call it civilized would be a grave error. You'll need to make use of a great number of skills if you want to survive its dangers. 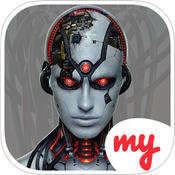 Fight fast-paced tactical battles against multiple enemies using a wide array of futuristic armaments. Build and safeguard a base of operations where you can learn new things about Utopia and fabricate better equipment. Explore the dangerous wastes and gather what you can to uncover the mystery of the planet. Evolution is the name of the game; you either adapt or you die. Shortly after making landfall on Utopia, it's imperative that you establish a central headquarters. It's here where you and your crew can find safety, store valuable resources, and develop new technologies that will make roughing it out in the wilderness much easier. • Deploy advanced turrets to ward off enemy attacks that could come at any moment. • Build better and more advanced weapons and suits of armor at the Arsenal. Utopia is a dangerous place. It's filled with aliens, renegade robots, cyborgs and even humans that have descended into savagery. All of them are incredibly powerful, heavily armed, and willing to do whatever it takes to survive. Words are useless on Utopia; you need a fast trigger finger and a tactical mind. • Kill your foes using pistols, rifles, shotguns and more. • Project an energy shield to avoid heavy gunfire. • Supercharge your gun while reloading and improve its lethality. • Use Aimed Shots to target vulnerable parts of your foes. Shoot them in the head for extra damage! 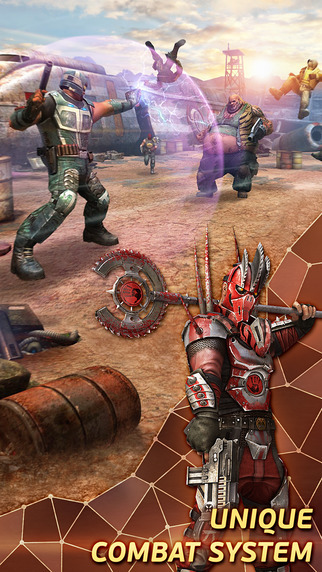 • Hurl grenades at your attackers and catch any that are thrown at you. If you've got a hankering for a game that will give you a real challenge, then nothing will quell your thirst better than Evolution: Battle for Utopia. With incredibly dangerous combat encounters, careful resource management, deep technological advancement, and an intriguing science fiction story that produces more questions than answers, it is one of the absolute best mobile games you can get right now. 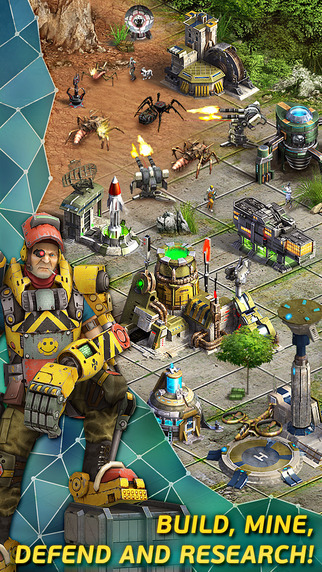 If you think you've got the guts to survive on Utopia, then take the next step for mobile gaming with Evolution. Most games are confident enough to stick to one genre. Evolution: Battle for Utopia is not one of those games. By combining a base builder with an RPG and a puzzler, and setting it all against a narrative-driven backdrop, it proves to be one of the most varied free-to-play games on the market right now. Usually, a game that tries to do so much at once bites off more than it can chew, but Evolution actually manages to pull through and make an experience that's surprisingly polished and engaging. Granted, it has some glaring flaws, but they're more related to the app's money-making model, not its actual design. Words alone cannot describe the visuals of Evolution. They are excellent and by far some of the best you will ever see on a screen so small. The backgrounds in the exploration portions are appropriately scenic, portraying lush and colorful fields of green alien plant life, harsh and unforgiving deserts, and rusted-out ruins that the planet's few human inhabitants use as shelter. Things get even better when you enter battle; you get to see everything up close and rendered with superbly-detailed 3D models. There's a good variety of people, robots and creatures to be seen, they use all sorts of flashy moves when fighting, and even the player character will change appearance as you give him better armor. Sound design is also well done with a great soundtrack accompanying your journey. When things are relatively calm and peaceful, the music is atmospheric and rife with ambience. However, it quickly picks up when you enter battle, with heavy guitar riffs punctuating the explosions you'll undoubtedly see. Sound effects are just as powerful and give every action you see on-screen an appropriate kick. The voice acting is also well done. Granted, a lot of it, like the protagonist's gravelly tone, is pretty comical, but even that has its own charm. Overall, the folks over at My.com made a fantastic-looking game that really pushes what an Android or iPhone-compatible device is capable of doing. A lot was put into Evolution's aesthetics, but the really good news is that it plays about as well as it looks. Most of the game takes place from an overhead perspective where you can observe the lay of the land and interact with various things simply by tapping them with your finger. In most cases, these consist of enemies you have to kill, but there are also treasures to collect and terminals to hack. Hacking consists of playing one of a couple minigames. These things are generally small and simple, but also surprisingly fun and varied, with the best and thankfully most common being a node-matching game. This consists of trying to wire together every matching node on a grid without tangling them up via simple tap-and-drag controls. It's easy to learn and a welcome addition to the rest of the app, and would have been fun enough as its own standalone game. However, a game that calls itself Battle for Utopia is clearly not about hacking. It's about fighting. Thankfully, it delivers well on that front too. While the first few fights might fool you into thinking combat is fully automated, as your character attacks automatically without any input from you, it quickly becomes apparent that is not the case at all. For one thing, you choose which targets you want to aim for. For another, whenever you reload your gun, there's a sweet spot where if you tap the screen, you can temporarily charge your weapon up and temporarily increase its firepower. As you advance in the game, more and more tactical options open up to you. You can duck behind an energy shield when you're coming under heavy fire, chuck grenades at enemies whenever they're cowering behind their own shields, catch grenades that are thrown at you, and so on. Furthermore, you'll acquire more and more different types of weapons that not only have their own pros and cons, but also their own distinct attacks. For example, pistols have an aimed shot that gives you a chance to blow an attacker's head off, while assault rifles can freeze everyone up with a Stasis Shot. The hacking and combat portions of Evolution are so good that the generally more modest base-building side of the app might come across as disappointing. Unlike more focused games, you won't be setting up a whole city on Utopia. The base is much smaller and more rigid than that. There are fewer buildings and they can only be built on preset locations of the map. The reason why is because the base is meant to improve the player character. While there are a number of upgrades that improve the resource-gathering functions of the base, the end goal of everything you do there is to produce better equipment for your guy to take into the field. Luckily, there are a lot of things to research, including guns, armor suits, grenades and medical kits, and making new stuff always feels like an accomplishment. Unfortunately, the base is primarily where the app starts to share its most glaring flaws. The first of these is that you can only do one thing at a time. Whether that's researching new technology, producing a new item, setting up another building, or upgrading a current one, you can only do one at a time up until you purchase another task slot. The reason behind this is obvious: to slow the game down and attempt to squeeze a few dollars out of you. Furthermore, the rising cost for upgrades soon begins to exceed what you're capable of bringing in, forcing you to either pay more money or wait an incredibly long time to build your supplies up. While this can be acceptable to a degree for most free to play titles, it's much less forgiving in one that's trying to tell a story. There will come a time when your progress in Evolution will slow to a crawl if it doesn't screech to a halt. If you were getting into the surprisingly interesting plot it had going, it can be very frustrating. The slow pacing that eventually plagues Evolution: Battle for Utopia is tragic, because this is an otherwise stellar product. The production values are top-notch, the story is compelling, the battle system is amazingly fun, the puzzles are entertaining, and the way your power grows over time is great to see. If My.com could speed things up and be more lenient on the costs of later upgrades, this would be a top-tier app. Until and unless that happens, it's just going to have to settle for being good.